Discussion in 'B4R Questions' started by Erel, Jan 8, 2017. ESP32 is the next generation of ESP8266 chips. It is a relatively new chip and the SDK is not very mature. There are many things that are not working yet, however it does look promising. Make sure that you are able to run a program (empty program is good enough) with the Arduino IDE before you try it with B4R. - Wire / I2C didn't work. Maybe a problem with the specific board that I've used. - Network doesn't always connect. - ServerSocket cannot accept a connection (client->available errno 9). - EEPROM is not available. - Client.Connected returns True although the connection has broken (this breaks rHttpUtils2). Peter Simpson, maXim, inakigarm and 5 others like this. Do we need additional libraries like rESP8266, rESP8266WiFi,...? Some success: I was able to run a simple code on the ESP32 (writing with astream). However, a larger code did even not compile. I get this error message that also randomly popped up with an ESP8266. Without any changes in the code it worked after some trials with the ESP8266. "Adafruit_Sensor.h" enthält unbekannte Zeichen. Wenn der Code mit einer älteren Version von Arduino erstellt wurde, sollten Sie eventuell über Werkzeuge -> Kodierung korrigieren & neu laden den Sketch auf UTF-8-Kodierung aktualisieren. Wenn nicht, sollten Sie die ungültigen Zeichen manuell entfernen, um diese Warnung zu deaktivieren. WARNUNG: Bibliothek Wire behauptet auf [esp32] Architektur(en) ausgeführt werden zu können und ist möglicherweise inkompatibel mit Ihrem derzeitigen Board, welches auf [ESP32] Architektur(en) ausgeführt wird. WARNUNG: Bibliothek SPI behauptet auf [esp32] Architektur(en) ausgeführt werden zu können und ist möglicherweise inkompatibel mit Ihrem derzeitigen Board, welches auf [ESP32] Architektur(en) ausgeführt wird. Fehler beim Kompilieren für das Board ESP32 Dev Module. Did you try with arduino IDE? As I said, this works with the ESP8266 so I conclude the error is unrelated to the error message!! Only occasionally I got that error with the '8266, sometimes it was apparently related to a wrong com-port setting or too high speed -or whatever. With the ESP32 I have no success at all for that code (the simple one worked at once). There is a recent Adafruit_SSD1306 library that includes the ESP32 (seen inside the .cpp file). When copying the cpp and .h files to the B4R Libraries folder, a lot of errors pops up upon compiling. So it appears to me that the B4R library needs to be updated. Seems to me that their GFX library was not updated to support the ESP32. Are you able to run their examples on the ESP32 with Arduino IDE? The Arduino the ssd1306_128x64_i2c example compiles. Does it work on the ESP32? Update: Successfully uploaded the Arduino SSD1306 example to the Sparkfun ESP32 board. (compiles without error, did not check uploading since oled is hooked up to an nodemcu). I'm getting errors when I try to compile this example with Arduino IDE. Using the latest versions of these libraries. I will leave it open for now. The ESP32-DevKitC is a small-sized ESP32-based development board produced by Espressif. Development PC (old) Toshiba Notebook Satellite with Windows Vista. * copy xtensa-esp32-elf-win32-VERSION.zip to folder <users>\documents\Arduino\hardware\espressif\esp32\tools\dist. The version used 1.22.0-59. To test the setup OK, start the Arduino IDE 1.8.0 (or higher), select File > examples > Examples for the ESP32 Dev Module > WiFiScan and compile & run. If running OK (which did), close the Arduino IDE and start B4R IDE. After connecting the ESP32, determine the COM Port. For the ESP32-DevKitC, to flash programs from development environments, like Arduino IDE or B4R 1.8.0 (or higher). * Compile and upload. Wait till message "waiting for download" in the B4R IDE Log Tab appears. rst:0x1 (POWERON_RESET),boot:0x13 (SPI_FAST_FLASH_BOOT) flash read err, 1000 Falling back to built-in command interpreter. 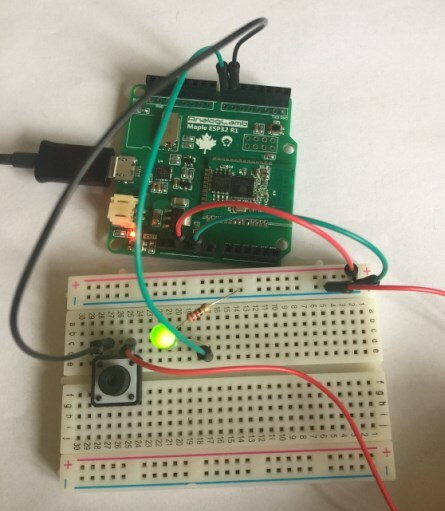 After the simple LED blink example, did not came any further as errors occurred as described in Post #1. Will stop further testing for now, till any updates available. Beside B4R Beta updates, not clear how the ESP32 files (as installed following the instructions) will be updated. Beside B4R Beta updates, not clear how the ESP32 files (as installated following the instructions) will be updated. I think that you only need to run step #5 to download and install the latest ESP32 SDK. Hm. Could you post the error message? "C:\Program Files (x86)\Arduino\hardware\espressif\ESP32/tools/xtensa-esp32-elf/bin/xtensa-esp32-elf-g++" -DESP_PLATFORM -DMBEDTLS_CONFIG_FILE='"mbedtls/esp_config.h"' -DHAVE_CONFIG_H "-IC:\Program Files (x86)\Arduino\hardware\espressif\ESP32/tools/sdk/include/config" "-IC:\Program Files (x86)\Arduino\hardware\espressif\ESP32/tools/sdk/include/bt" "-IC:\Program Files (x86)\Arduino\hardware\espressif\ESP32/tools/sdk/include/driver" "-IC:\Program Files (x86)\Arduino\hardware\espressif\ESP32/tools/sdk/include/esp32" "-IC:\Program Files (x86)\Arduino\hardware\espressif\ESP32/tools/sdk/include/ethernet" "-IC:\Program Files (x86)\Arduino\hardware\espressif\ESP32/tools/sdk/include/freertos" "-IC:\Program Files (x86)\Arduino\hardware\espressif\ESP32/tools/sdk/include/log" "-IC:\Program Files (x86)\Arduino\hardware\espressif\ESP32/tools/sdk/include/vfs" "-IC:\Program Files (x86)\Arduino\hardware\espressif\ESP32/tools/sdk/include/ulp" "-IC:\Program Files (x86)\Arduino\hardware\espressif\ESP32/tools/sdk/include/newlib" "-IC:\Program Files (x86)\Arduino\hardware\espressif\ESP32/tools/sdk/include/nvs_flash" "-IC:\Program Files (x86)\Arduino\hardware\espressif\ESP32/tools/sdk/include/spi_flash" "-IC:\Program Files (x86)\Arduino\hardware\espressif\ESP32/tools/sdk/include/openssl" "-IC:\Program Files (x86)\Arduino\hardware\espressif\ESP32/tools/sdk/include/app_update" "-IC:\Program Files (x86)\Arduino\hardware\espressif\ESP32/tools/sdk/include/tcpip_adapter" "-IC:\Program Files (x86)\Arduino\hardware\espressif\ESP32/tools/sdk/include/xtensa-debug-module" "-IC:\Program Files (x86)\Arduino\hardware\espressif\ESP32/tools/sdk/include/wpa_supplicant" "-IC:\Program Files (x86)\Arduino\hardware\espressif\ESP32/tools/sdk/include/expat" "-IC:\Program Files (x86)\Arduino\hardware\espressif\ESP32/tools/sdk/include/json" "-IC:\Program Files (x86)\Arduino\hardware\espressif\ESP32/tools/sdk/include/mbedtls" "-IC:\Program Files (x86)\Arduino\hardware\espressif\ESP32/tools/sdk/include/nghttp" "-IC:\Program Files (x86)\Arduino\hardware\espressif\ESP32/tools/sdk/include/lwip" -std=gnu++11 -fno-exceptions -fno-rtti -Os -g3 -Wpointer-arith -ffunction-sections -fdata-sections -fstrict-volatile-bitfields -mlongcalls -nostdlib -w -Wno-error=unused-function -Wno-error=unused-but-set-variable -Wno-error=unused-variable -Wno-error=deprecated-declarations -Wno-unused-parameter -Wno-sign-compare -fno-rtti -c -w -x c++ -E -CC -DF_CPU=240000000L -DARDUINO=10800 -DARDUINO_ESP32_DEV -DARDUINO_ARCH_ESP32 -DESP32 "-IC:\Program Files (x86)\Arduino\hardware\espressif\ESP32\cores\esp32" "-IC:\Program Files (x86)\Arduino\hardware\espressif\ESP32\variants\esp32" "D:\B4R\Objects\bin\sketch\ssd1306_128x64_i2c.ino.cpp" -o "nul"
"C:\Program Files (x86)\Arduino\hardware\espressif\ESP32/tools/xtensa-esp32-elf/bin/xtensa-esp32-elf-g++" -DESP_PLATFORM -DMBEDTLS_CONFIG_FILE='"mbedtls/esp_config.h"' -DHAVE_CONFIG_H "-IC:\Program Files (x86)\Arduino\hardware\espressif\ESP32/tools/sdk/include/config" "-IC:\Program Files (x86)\Arduino\hardware\espressif\ESP32/tools/sdk/include/bt" "-IC:\Program Files (x86)\Arduino\hardware\espressif\ESP32/tools/sdk/include/driver" "-IC:\Program Files (x86)\Arduino\hardware\espressif\ESP32/tools/sdk/include/esp32" "-IC:\Program Files (x86)\Arduino\hardware\espressif\ESP32/tools/sdk/include/ethernet" "-IC:\Program Files (x86)\Arduino\hardware\espressif\ESP32/tools/sdk/include/freertos" "-IC:\Program Files (x86)\Arduino\hardware\espressif\ESP32/tools/sdk/include/log" "-IC:\Program Files (x86)\Arduino\hardware\espressif\ESP32/tools/sdk/include/vfs" "-IC:\Program Files (x86)\Arduino\hardware\espressif\ESP32/tools/sdk/include/ulp" "-IC:\Program Files (x86)\Arduino\hardware\espressif\ESP32/tools/sdk/include/newlib" "-IC:\Program Files (x86)\Arduino\hardware\espressif\ESP32/tools/sdk/include/nvs_flash" "-IC:\Program Files (x86)\Arduino\hardware\espressif\ESP32/tools/sdk/include/spi_flash" "-IC:\Program Files (x86)\Arduino\hardware\espressif\ESP32/tools/sdk/include/openssl" "-IC:\Program Files (x86)\Arduino\hardware\espressif\ESP32/tools/sdk/include/app_update" "-IC:\Program Files (x86)\Arduino\hardware\espressif\ESP32/tools/sdk/include/tcpip_adapter" "-IC:\Program Files (x86)\Arduino\hardware\espressif\ESP32/tools/sdk/include/xtensa-debug-module" "-IC:\Program Files (x86)\Arduino\hardware\espressif\ESP32/tools/sdk/include/wpa_supplicant" "-IC:\Program Files (x86)\Arduino\hardware\espressif\ESP32/tools/sdk/include/expat" "-IC:\Program Files (x86)\Arduino\hardware\espressif\ESP32/tools/sdk/include/json" "-IC:\Program Files (x86)\Arduino\hardware\espressif\ESP32/tools/sdk/include/mbedtls" "-IC:\Program Files (x86)\Arduino\hardware\espressif\ESP32/tools/sdk/include/nghttp" "-IC:\Program Files (x86)\Arduino\hardware\espressif\ESP32/tools/sdk/include/lwip" -std=gnu++11 -fno-exceptions -fno-rtti -Os -g3 -Wpointer-arith -ffunction-sections -fdata-sections -fstrict-volatile-bitfields -mlongcalls -nostdlib -w -Wno-error=unused-function -Wno-error=unused-but-set-variable -Wno-error=unused-variable -Wno-error=deprecated-declarations -Wno-unused-parameter -Wno-sign-compare -fno-rtti -c -w -x c++ -E -CC -DF_CPU=240000000L -DARDUINO=10800 -DARDUINO_ESP32_DEV -DARDUINO_ARCH_ESP32 -DESP32 "-IC:\Program Files (x86)\Arduino\hardware\espressif\ESP32\cores\esp32" "-IC:\Program Files (x86)\Arduino\hardware\espressif\ESP32\variants\esp32" "-IC:\Program Files (x86)\Arduino\hardware\espressif\ESP32\libraries\SPI\src" "D:\B4R\Objects\bin\sketch\ssd1306_128x64_i2c.ino.cpp" -o "nul"
"C:\Program Files (x86)\Arduino\hardware\espressif\ESP32/tools/xtensa-esp32-elf/bin/xtensa-esp32-elf-g++" -DESP_PLATFORM -DMBEDTLS_CONFIG_FILE='"mbedtls/esp_config.h"' -DHAVE_CONFIG_H "-IC:\Program Files (x86)\Arduino\hardware\espressif\ESP32/tools/sdk/include/config" "-IC:\Program Files (x86)\Arduino\hardware\espressif\ESP32/tools/sdk/include/bt" "-IC:\Program Files (x86)\Arduino\hardware\espressif\ESP32/tools/sdk/include/driver" "-IC:\Program Files (x86)\Arduino\hardware\espressif\ESP32/tools/sdk/include/esp32" "-IC:\Program Files (x86)\Arduino\hardware\espressif\ESP32/tools/sdk/include/ethernet" "-IC:\Program Files (x86)\Arduino\hardware\espressif\ESP32/tools/sdk/include/freertos" "-IC:\Program Files (x86)\Arduino\hardware\espressif\ESP32/tools/sdk/include/log" "-IC:\Program Files (x86)\Arduino\hardware\espressif\ESP32/tools/sdk/include/vfs" "-IC:\Program Files (x86)\Arduino\hardware\espressif\ESP32/tools/sdk/include/ulp" "-IC:\Program Files (x86)\Arduino\hardware\espressif\ESP32/tools/sdk/include/newlib" "-IC:\Program Files (x86)\Arduino\hardware\espressif\ESP32/tools/sdk/include/nvs_flash" "-IC:\Program Files (x86)\Arduino\hardware\espressif\ESP32/tools/sdk/include/spi_flash" "-IC:\Program Files (x86)\Arduino\hardware\espressif\ESP32/tools/sdk/include/openssl" "-IC:\Program Files (x86)\Arduino\hardware\espressif\ESP32/tools/sdk/include/app_update" "-IC:\Program Files (x86)\Arduino\hardware\espressif\ESP32/tools/sdk/include/tcpip_adapter" "-IC:\Program Files (x86)\Arduino\hardware\espressif\ESP32/tools/sdk/include/xtensa-debug-module" "-IC:\Program Files (x86)\Arduino\hardware\espressif\ESP32/tools/sdk/include/wpa_supplicant" "-IC:\Program Files (x86)\Arduino\hardware\espressif\ESP32/tools/sdk/include/expat" "-IC:\Program Files (x86)\Arduino\hardware\espressif\ESP32/tools/sdk/include/json" "-IC:\Program Files (x86)\Arduino\hardware\espressif\ESP32/tools/sdk/include/mbedtls" "-IC:\Program Files (x86)\Arduino\hardware\espressif\ESP32/tools/sdk/include/nghttp" "-IC:\Program Files (x86)\Arduino\hardware\espressif\ESP32/tools/sdk/include/lwip" -std=gnu++11 -fno-exceptions -fno-rtti -Os -g3 -Wpointer-arith -ffunction-sections -fdata-sections -fstrict-volatile-bitfields -mlongcalls -nostdlib -w -Wno-error=unused-function -Wno-error=unused-but-set-variable -Wno-error=unused-variable -Wno-error=deprecated-declarations -Wno-unused-parameter -Wno-sign-compare -fno-rtti -c -w -x c++ -E -CC -DF_CPU=240000000L -DARDUINO=10800 -DARDUINO_ESP32_DEV -DARDUINO_ARCH_ESP32 -DESP32 "-IC:\Program Files (x86)\Arduino\hardware\espressif\ESP32\cores\esp32" "-IC:\Program Files (x86)\Arduino\hardware\espressif\ESP32\variants\esp32" "-IC:\Program Files (x86)\Arduino\hardware\espressif\ESP32\libraries\SPI\src" "-IC:\Program Files (x86)\Arduino\hardware\espressif\ESP32\libraries\Wire\src" "D:\B4R\Objects\bin\sketch\ssd1306_128x64_i2c.ino.cpp" -o "nul"
"C:\Program Files (x86)\Arduino\hardware\espressif\ESP32/tools/xtensa-esp32-elf/bin/xtensa-esp32-elf-g++" -DESP_PLATFORM -DMBEDTLS_CONFIG_FILE='"mbedtls/esp_config.h"' -DHAVE_CONFIG_H "-IC:\Program Files (x86)\Arduino\hardware\espressif\ESP32/tools/sdk/include/config" "-IC:\Program Files (x86)\Arduino\hardware\espressif\ESP32/tools/sdk/include/bt" "-IC:\Program Files (x86)\Arduino\hardware\espressif\ESP32/tools/sdk/include/driver" "-IC:\Program Files (x86)\Arduino\hardware\espressif\ESP32/tools/sdk/include/esp32" "-IC:\Program Files (x86)\Arduino\hardware\espressif\ESP32/tools/sdk/include/ethernet" "-IC:\Program Files (x86)\Arduino\hardware\espressif\ESP32/tools/sdk/include/freertos" "-IC:\Program Files (x86)\Arduino\hardware\espressif\ESP32/tools/sdk/include/log" "-IC:\Program Files (x86)\Arduino\hardware\espressif\ESP32/tools/sdk/include/vfs" "-IC:\Program Files (x86)\Arduino\hardware\espressif\ESP32/tools/sdk/include/ulp" "-IC:\Program Files (x86)\Arduino\hardware\espressif\ESP32/tools/sdk/include/newlib" "-IC:\Program Files (x86)\Arduino\hardware\espressif\ESP32/tools/sdk/include/nvs_flash" "-IC:\Program Files (x86)\Arduino\hardware\espressif\ESP32/tools/sdk/include/spi_flash" "-IC:\Program Files (x86)\Arduino\hardware\espressif\ESP32/tools/sdk/include/openssl" "-IC:\Program Files (x86)\Arduino\hardware\espressif\ESP32/tools/sdk/include/app_update" "-IC:\Program Files (x86)\Arduino\hardware\espressif\ESP32/tools/sdk/include/tcpip_adapter" "-IC:\Program Files (x86)\Arduino\hardware\espressif\ESP32/tools/sdk/include/xtensa-debug-module" "-IC:\Program Files (x86)\Arduino\hardware\espressif\ESP32/tools/sdk/include/wpa_supplicant" "-IC:\Program Files (x86)\Arduino\hardware\espressif\ESP32/tools/sdk/include/expat" "-IC:\Program Files (x86)\Arduino\hardware\espressif\ESP32/tools/sdk/include/json" "-IC:\Program Files (x86)\Arduino\hardware\espressif\ESP32/tools/sdk/include/mbedtls" "-IC:\Program Files (x86)\Arduino\hardware\espressif\ESP32/tools/sdk/include/nghttp" "-IC:\Program Files (x86)\Arduino\hardware\espressif\ESP32/tools/sdk/include/lwip" -std=gnu++11 -fno-exceptions -fno-rtti -Os -g3 -Wpointer-arith -ffunction-sections -fdata-sections -fstrict-volatile-bitfields -mlongcalls -nostdlib -w -Wno-error=unused-function -Wno-error=unused-but-set-variable -Wno-error=unused-variable -Wno-error=deprecated-declarations -Wno-unused-parameter -Wno-sign-compare -fno-rtti -c -w -x c++ -E -CC -DF_CPU=240000000L -DARDUINO=10800 -DARDUINO_ESP32_DEV -DARDUINO_ARCH_ESP32 -DESP32 "-IC:\Program Files (x86)\Arduino\hardware\espressif\ESP32\cores\esp32" "-IC:\Program Files (x86)\Arduino\hardware\espressif\ESP32\variants\esp32" "-IC:\Program Files (x86)\Arduino\hardware\espressif\ESP32\libraries\SPI\src" "-IC:\Program Files (x86)\Arduino\hardware\espressif\ESP32\libraries\Wire\src" "-ID:\Program Files (x86)\Arduino\libraries\Adafruit_GFX_Library" "D:\B4R\Objects\bin\sketch\ssd1306_128x64_i2c.ino.cpp" -o "nul"
"C:\Program Files (x86)\Arduino\hardware\espressif\ESP32/tools/xtensa-esp32-elf/bin/xtensa-esp32-elf-g++" -DESP_PLATFORM -DMBEDTLS_CONFIG_FILE='"mbedtls/esp_config.h"' -DHAVE_CONFIG_H "-IC:\Program Files (x86)\Arduino\hardware\espressif\ESP32/tools/sdk/include/config" "-IC:\Program Files (x86)\Arduino\hardware\espressif\ESP32/tools/sdk/include/bt" "-IC:\Program Files (x86)\Arduino\hardware\espressif\ESP32/tools/sdk/include/driver" "-IC:\Program Files (x86)\Arduino\hardware\espressif\ESP32/tools/sdk/include/esp32" "-IC:\Program Files (x86)\Arduino\hardware\espressif\ESP32/tools/sdk/include/ethernet" "-IC:\Program Files (x86)\Arduino\hardware\espressif\ESP32/tools/sdk/include/freertos" "-IC:\Program Files (x86)\Arduino\hardware\espressif\ESP32/tools/sdk/include/log" "-IC:\Program Files (x86)\Arduino\hardware\espressif\ESP32/tools/sdk/include/vfs" "-IC:\Program Files (x86)\Arduino\hardware\espressif\ESP32/tools/sdk/include/ulp" "-IC:\Program Files (x86)\Arduino\hardware\espressif\ESP32/tools/sdk/include/newlib" "-IC:\Program Files (x86)\Arduino\hardware\espressif\ESP32/tools/sdk/include/nvs_flash" "-IC:\Program Files (x86)\Arduino\hardware\espressif\ESP32/tools/sdk/include/spi_flash" "-IC:\Program Files (x86)\Arduino\hardware\espressif\ESP32/tools/sdk/include/openssl" "-IC:\Program Files (x86)\Arduino\hardware\espressif\ESP32/tools/sdk/include/app_update" "-IC:\Program Files (x86)\Arduino\hardware\espressif\ESP32/tools/sdk/include/tcpip_adapter" "-IC:\Program Files (x86)\Arduino\hardware\espressif\ESP32/tools/sdk/include/xtensa-debug-module" "-IC:\Program Files (x86)\Arduino\hardware\espressif\ESP32/tools/sdk/include/wpa_supplicant" "-IC:\Program Files (x86)\Arduino\hardware\espressif\ESP32/tools/sdk/include/expat" "-IC:\Program Files (x86)\Arduino\hardware\espressif\ESP32/tools/sdk/include/json" "-IC:\Program Files (x86)\Arduino\hardware\espressif\ESP32/tools/sdk/include/mbedtls" "-IC:\Program Files (x86)\Arduino\hardware\espressif\ESP32/tools/sdk/include/nghttp" "-IC:\Program Files (x86)\Arduino\hardware\espressif\ESP32/tools/sdk/include/lwip" -std=gnu++11 -fno-exceptions -fno-rtti -Os -g3 -Wpointer-arith -ffunction-sections -fdata-sections -fstrict-volatile-bitfields -mlongcalls -nostdlib -w -Wno-error=unused-function -Wno-error=unused-but-set-variable -Wno-error=unused-variable -Wno-error=deprecated-declarations -Wno-unused-parameter -Wno-sign-compare -fno-rtti -c -w -x c++ -E -CC -DF_CPU=240000000L -DARDUINO=10800 -DARDUINO_ESP32_DEV -DARDUINO_ARCH_ESP32 -DESP32 "-IC:\Program Files (x86)\Arduino\hardware\espressif\ESP32\cores\esp32" "-IC:\Program Files (x86)\Arduino\hardware\espressif\ESP32\variants\esp32" "-IC:\Program Files (x86)\Arduino\hardware\espressif\ESP32\libraries\SPI\src" "-IC:\Program Files (x86)\Arduino\hardware\espressif\ESP32\libraries\Wire\src" "-ID:\Program Files (x86)\Arduino\libraries\Adafruit_GFX_Library" "-ID:\Program Files (x86)\Arduino\libraries\Adafruit_SSD1306" "D:\B4R\Objects\bin\sketch\ssd1306_128x64_i2c.ino.cpp" -o "nul"
"C:\Program Files (x86)\Arduino\hardware\espressif\ESP32/tools/xtensa-esp32-elf/bin/xtensa-esp32-elf-g++" -DESP_PLATFORM -DMBEDTLS_CONFIG_FILE='"mbedtls/esp_config.h"' -DHAVE_CONFIG_H "-IC:\Program Files (x86)\Arduino\hardware\espressif\ESP32/tools/sdk/include/config" "-IC:\Program Files (x86)\Arduino\hardware\espressif\ESP32/tools/sdk/include/bt" "-IC:\Program Files (x86)\Arduino\hardware\espressif\ESP32/tools/sdk/include/driver" "-IC:\Program Files (x86)\Arduino\hardware\espressif\ESP32/tools/sdk/include/esp32" "-IC:\Program Files (x86)\Arduino\hardware\espressif\ESP32/tools/sdk/include/ethernet" "-IC:\Program Files (x86)\Arduino\hardware\espressif\ESP32/tools/sdk/include/freertos" "-IC:\Program Files (x86)\Arduino\hardware\espressif\ESP32/tools/sdk/include/log" "-IC:\Program Files (x86)\Arduino\hardware\espressif\ESP32/tools/sdk/include/vfs" "-IC:\Program Files (x86)\Arduino\hardware\espressif\ESP32/tools/sdk/include/ulp" "-IC:\Program Files (x86)\Arduino\hardware\espressif\ESP32/tools/sdk/include/newlib" "-IC:\Program Files (x86)\Arduino\hardware\espressif\ESP32/tools/sdk/include/nvs_flash" "-IC:\Program Files (x86)\Arduino\hardware\espressif\ESP32/tools/sdk/include/spi_flash" "-IC:\Program Files (x86)\Arduino\hardware\espressif\ESP32/tools/sdk/include/openssl" "-IC:\Program Files (x86)\Arduino\hardware\espressif\ESP32/tools/sdk/include/app_update" "-IC:\Program Files (x86)\Arduino\hardware\espressif\ESP32/tools/sdk/include/tcpip_adapter" "-IC:\Program Files (x86)\Arduino\hardware\espressif\ESP32/tools/sdk/include/xtensa-debug-module" "-IC:\Program Files (x86)\Arduino\hardware\espressif\ESP32/tools/sdk/include/wpa_supplicant" "-IC:\Program Files (x86)\Arduino\hardware\espressif\ESP32/tools/sdk/include/expat" "-IC:\Program Files (x86)\Arduino\hardware\espressif\ESP32/tools/sdk/include/json" "-IC:\Program Files (x86)\Arduino\hardware\espressif\ESP32/tools/sdk/include/mbedtls" "-IC:\Program Files (x86)\Arduino\hardware\espressif\ESP32/tools/sdk/include/nghttp" "-IC:\Program Files (x86)\Arduino\hardware\espressif\ESP32/tools/sdk/include/lwip" -std=gnu++11 -fno-exceptions -fno-rtti -Os -g3 -Wpointer-arith -ffunction-sections -fdata-sections -fstrict-volatile-bitfields -mlongcalls -nostdlib -w -Wno-error=unused-function -Wno-error=unused-but-set-variable -Wno-error=unused-variable -Wno-error=deprecated-declarations -Wno-unused-parameter -Wno-sign-compare -fno-rtti -c -w -x c++ -E -CC -DF_CPU=240000000L -DARDUINO=10800 -DARDUINO_ESP32_DEV -DARDUINO_ARCH_ESP32 -DESP32 "-IC:\Program Files (x86)\Arduino\hardware\espressif\ESP32\cores\esp32" "-IC:\Program Files (x86)\Arduino\hardware\espressif\ESP32\variants\esp32" "-IC:\Program Files (x86)\Arduino\hardware\espressif\ESP32\libraries\SPI\src" "-IC:\Program Files (x86)\Arduino\hardware\espressif\ESP32\libraries\Wire\src" "-ID:\Program Files (x86)\Arduino\libraries\Adafruit_GFX_Library" "-ID:\Program Files (x86)\Arduino\libraries\Adafruit_SSD1306" "D:\B4R\Objects\bin\sketch\ssd1306_128x64_i2c.ino.cpp" -o "D:\B4R\Objects\bin\preproc\ctags_target_for_gcc_minus_e.cpp"
"C:\Program Files (x86)\Arduino\tools-builder\ctags\5.8-arduino11/ctags" -u --language-force=c++ -f - --c++-kinds=svpf --fields=KSTtzns --line-directives "D:\B4R\Objects\bin\preproc\ctags_target_for_gcc_minus_e.cpp"
"C:\Program Files (x86)\Arduino\hardware\espressif\ESP32/tools/xtensa-esp32-elf/bin/xtensa-esp32-elf-g++" -DESP_PLATFORM -DMBEDTLS_CONFIG_FILE='"mbedtls/esp_config.h"' -DHAVE_CONFIG_H "-IC:\Program Files (x86)\Arduino\hardware\espressif\ESP32/tools/sdk/include/config" "-IC:\Program Files (x86)\Arduino\hardware\espressif\ESP32/tools/sdk/include/bt" "-IC:\Program Files (x86)\Arduino\hardware\espressif\ESP32/tools/sdk/include/driver" "-IC:\Program Files (x86)\Arduino\hardware\espressif\ESP32/tools/sdk/include/esp32" "-IC:\Program Files (x86)\Arduino\hardware\espressif\ESP32/tools/sdk/include/ethernet" "-IC:\Program Files (x86)\Arduino\hardware\espressif\ESP32/tools/sdk/include/freertos" "-IC:\Program Files (x86)\Arduino\hardware\espressif\ESP32/tools/sdk/include/log" "-IC:\Program Files (x86)\Arduino\hardware\espressif\ESP32/tools/sdk/include/vfs" "-IC:\Program Files (x86)\Arduino\hardware\espressif\ESP32/tools/sdk/include/ulp" "-IC:\Program Files (x86)\Arduino\hardware\espressif\ESP32/tools/sdk/include/newlib" "-IC:\Program Files (x86)\Arduino\hardware\espressif\ESP32/tools/sdk/include/nvs_flash" "-IC:\Program Files (x86)\Arduino\hardware\espressif\ESP32/tools/sdk/include/spi_flash" "-IC:\Program Files (x86)\Arduino\hardware\espressif\ESP32/tools/sdk/include/openssl" "-IC:\Program Files (x86)\Arduino\hardware\espressif\ESP32/tools/sdk/include/app_update" "-IC:\Program Files (x86)\Arduino\hardware\espressif\ESP32/tools/sdk/include/tcpip_adapter" "-IC:\Program Files (x86)\Arduino\hardware\espressif\ESP32/tools/sdk/include/xtensa-debug-module" "-IC:\Program Files (x86)\Arduino\hardware\espressif\ESP32/tools/sdk/include/wpa_supplicant" "-IC:\Program Files (x86)\Arduino\hardware\espressif\ESP32/tools/sdk/include/expat" "-IC:\Program Files (x86)\Arduino\hardware\espressif\ESP32/tools/sdk/include/json" "-IC:\Program Files (x86)\Arduino\hardware\espressif\ESP32/tools/sdk/include/mbedtls" "-IC:\Program Files (x86)\Arduino\hardware\espressif\ESP32/tools/sdk/include/nghttp" "-IC:\Program Files (x86)\Arduino\hardware\espressif\ESP32/tools/sdk/include/lwip" -std=gnu++11 -fno-exceptions -fno-rtti -Os -g3 -Wpointer-arith -ffunction-sections -fdata-sections -fstrict-volatile-bitfields -mlongcalls -nostdlib -w -Wno-error=unused-function -Wno-error=unused-but-set-variable -Wno-error=unused-variable -Wno-error=deprecated-declarations -Wno-unused-parameter -Wno-sign-compare -fno-rtti -MMD -c -DF_CPU=240000000L -DARDUINO=10800 -DARDUINO_ESP32_DEV -DARDUINO_ARCH_ESP32 -DESP32 "-IC:\Program Files (x86)\Arduino\hardware\espressif\ESP32\cores\esp32" "-IC:\Program Files (x86)\Arduino\hardware\espressif\ESP32\variants\esp32" "-IC:\Program Files (x86)\Arduino\hardware\espressif\ESP32\libraries\SPI\src" "-IC:\Program Files (x86)\Arduino\hardware\espressif\ESP32\libraries\Wire\src" "-ID:\Program Files (x86)\Arduino\libraries\Adafruit_GFX_Library" "-ID:\Program Files (x86)\Arduino\libraries\Adafruit_SSD1306" "D:\B4R\Objects\bin\sketch\ssd1306_128x64_i2c.ino.cpp" -o "D:\B4R\Objects\bin\sketch\ssd1306_128x64_i2c.ino.cpp.o"
"C:\Program Files (x86)\Arduino\hardware\espressif\ESP32/tools/xtensa-esp32-elf/bin/xtensa-esp32-elf-ar" cru "D:\B4R\Objects\bin/arduino.ar" "D:\B4R\Objects\bin\core\esp32-hal-adc.c.o"
"C:\Program Files (x86)\Arduino\hardware\espressif\ESP32/tools/xtensa-esp32-elf/bin/xtensa-esp32-elf-ar" cru "D:\B4R\Objects\bin/arduino.ar" "D:\B4R\Objects\bin\core\esp32-hal-dac.c.o"
"C:\Program Files (x86)\Arduino\hardware\espressif\ESP32/tools/xtensa-esp32-elf/bin/xtensa-esp32-elf-ar" cru "D:\B4R\Objects\bin/arduino.ar" "D:\B4R\Objects\bin\core\esp32-hal-gpio.c.o"
"C:\Program Files (x86)\Arduino\hardware\espressif\ESP32/tools/xtensa-esp32-elf/bin/xtensa-esp32-elf-ar" cru "D:\B4R\Objects\bin/arduino.ar" "D:\B4R\Objects\bin\core\esp32-hal-i2c.c.o"
"C:\Program Files (x86)\Arduino\hardware\espressif\ESP32/tools/xtensa-esp32-elf/bin/xtensa-esp32-elf-ar" cru "D:\B4R\Objects\bin/arduino.ar" "D:\B4R\Objects\bin\core\esp32-hal-ledc.c.o"
"C:\Program Files (x86)\Arduino\hardware\espressif\ESP32/tools/xtensa-esp32-elf/bin/xtensa-esp32-elf-ar" cru "D:\B4R\Objects\bin/arduino.ar" "D:\B4R\Objects\bin\core\esp32-hal-matrix.c.o"
"C:\Program Files (x86)\Arduino\hardware\espressif\ESP32/tools/xtensa-esp32-elf/bin/xtensa-esp32-elf-ar" cru "D:\B4R\Objects\bin/arduino.ar" "D:\B4R\Objects\bin\core\esp32-hal-misc.c.o"
"C:\Program Files (x86)\Arduino\hardware\espressif\ESP32/tools/xtensa-esp32-elf/bin/xtensa-esp32-elf-ar" cru "D:\B4R\Objects\bin/arduino.ar" "D:\B4R\Objects\bin\core\esp32-hal-sd.c.o"
"C:\Program Files (x86)\Arduino\hardware\espressif\ESP32/tools/xtensa-esp32-elf/bin/xtensa-esp32-elf-ar" cru "D:\B4R\Objects\bin/arduino.ar" "D:\B4R\Objects\bin\core\esp32-hal-spi.c.o"
"C:\Program Files (x86)\Arduino\hardware\espressif\ESP32/tools/xtensa-esp32-elf/bin/xtensa-esp32-elf-ar" cru "D:\B4R\Objects\bin/arduino.ar" "D:\B4R\Objects\bin\core\esp32-hal-timer.c.o"
"C:\Program Files (x86)\Arduino\hardware\espressif\ESP32/tools/xtensa-esp32-elf/bin/xtensa-esp32-elf-ar" cru "D:\B4R\Objects\bin/arduino.ar" "D:\B4R\Objects\bin\core\esp32-hal-touch.c.o"
"C:\Program Files (x86)\Arduino\hardware\espressif\ESP32/tools/xtensa-esp32-elf/bin/xtensa-esp32-elf-ar" cru "D:\B4R\Objects\bin/arduino.ar" "D:\B4R\Objects\bin\core\esp32-hal-uart.c.o"
"C:\Program Files (x86)\Arduino\hardware\espressif\ESP32/tools/xtensa-esp32-elf/bin/xtensa-esp32-elf-ar" cru "D:\B4R\Objects\bin/arduino.ar" "D:\B4R\Objects\bin\core\stdlib_noniso.c.o"
"C:\Program Files (x86)\Arduino\hardware\espressif\ESP32/tools/xtensa-esp32-elf/bin/xtensa-esp32-elf-ar" cru "D:\B4R\Objects\bin/arduino.ar" "D:\B4R\Objects\bin\core\wiring_shift.c.o"
"C:\Program Files (x86)\Arduino\hardware\espressif\ESP32/tools/xtensa-esp32-elf/bin/xtensa-esp32-elf-ar" cru "D:\B4R\Objects\bin/arduino.ar" "D:\B4R\Objects\bin\core\libb64\cdecode.c.o"
"C:\Program Files (x86)\Arduino\hardware\espressif\ESP32/tools/xtensa-esp32-elf/bin/xtensa-esp32-elf-ar" cru "D:\B4R\Objects\bin/arduino.ar" "D:\B4R\Objects\bin\core\libb64\cencode.c.o"
"C:\Program Files (x86)\Arduino\hardware\espressif\ESP32/tools/xtensa-esp32-elf/bin/xtensa-esp32-elf-ar" cru "D:\B4R\Objects\bin/arduino.ar" "D:\B4R\Objects\bin\core\Esp.cpp.o"
"C:\Program Files (x86)\Arduino\hardware\espressif\ESP32/tools/xtensa-esp32-elf/bin/xtensa-esp32-elf-ar" cru "D:\B4R\Objects\bin/arduino.ar" "D:\B4R\Objects\bin\core\HardwareSerial.cpp.o"
"C:\Program Files (x86)\Arduino\hardware\espressif\ESP32/tools/xtensa-esp32-elf/bin/xtensa-esp32-elf-ar" cru "D:\B4R\Objects\bin/arduino.ar" "D:\B4R\Objects\bin\core\IPAddress.cpp.o"
"C:\Program Files (x86)\Arduino\hardware\espressif\ESP32/tools/xtensa-esp32-elf/bin/xtensa-esp32-elf-ar" cru "D:\B4R\Objects\bin/arduino.ar" "D:\B4R\Objects\bin\core\IPv6Address.cpp.o"
"C:\Program Files (x86)\Arduino\hardware\espressif\ESP32/tools/xtensa-esp32-elf/bin/xtensa-esp32-elf-ar" cru "D:\B4R\Objects\bin/arduino.ar" "D:\B4R\Objects\bin\core\MD5Builder.cpp.o"
"C:\Program Files (x86)\Arduino\hardware\espressif\ESP32/tools/xtensa-esp32-elf/bin/xtensa-esp32-elf-ar" cru "D:\B4R\Objects\bin/arduino.ar" "D:\B4R\Objects\bin\core\Print.cpp.o"
"C:\Program Files (x86)\Arduino\hardware\espressif\ESP32/tools/xtensa-esp32-elf/bin/xtensa-esp32-elf-ar" cru "D:\B4R\Objects\bin/arduino.ar" "D:\B4R\Objects\bin\core\Stream.cpp.o"
"C:\Program Files (x86)\Arduino\hardware\espressif\ESP32/tools/xtensa-esp32-elf/bin/xtensa-esp32-elf-ar" cru "D:\B4R\Objects\bin/arduino.ar" "D:\B4R\Objects\bin\core\StreamString.cpp.o"
"C:\Program Files (x86)\Arduino\hardware\espressif\ESP32/tools/xtensa-esp32-elf/bin/xtensa-esp32-elf-ar" cru "D:\B4R\Objects\bin/arduino.ar" "D:\B4R\Objects\bin\core\WMath.cpp.o"
"C:\Program Files (x86)\Arduino\hardware\espressif\ESP32/tools/xtensa-esp32-elf/bin/xtensa-esp32-elf-ar" cru "D:\B4R\Objects\bin/arduino.ar" "D:\B4R\Objects\bin\core\WString.cpp.o"
"C:\Program Files (x86)\Arduino\hardware\espressif\ESP32/tools/xtensa-esp32-elf/bin/xtensa-esp32-elf-ar" cru "D:\B4R\Objects\bin/arduino.ar" "D:\B4R\Objects\bin\core\base64.cpp.o"
"C:\Program Files (x86)\Arduino\hardware\espressif\ESP32/tools/xtensa-esp32-elf/bin/xtensa-esp32-elf-ar" cru "D:\B4R\Objects\bin/arduino.ar" "D:\B4R\Objects\bin\core\cbuf.cpp.o"
"C:\Program Files (x86)\Arduino\hardware\espressif\ESP32/tools/xtensa-esp32-elf/bin/xtensa-esp32-elf-ar" cru "D:\B4R\Objects\bin/arduino.ar" "D:\B4R\Objects\bin\core\main.cpp.o"
"C:\Program Files (x86)\Arduino\hardware\espressif\ESP32/tools/xtensa-esp32-elf/bin/xtensa-esp32-elf-gcc" -nostdlib "-LC:\Program Files (x86)\Arduino\hardware\espressif\ESP32/tools/sdk/lib" "-LC:\Program Files (x86)\Arduino\hardware\espressif\ESP32/tools/sdk/ld" -T esp32_out.ld -T esp32.common.ld -T esp32.rom.ld -T esp32.peripherals.ld -u call_user_start_cpu0 -Wl,--gc-sections -Wl,-static -Wl,--undefined=uxTopUsedPriority -Wl,--start-group "D:\B4R\Objects\bin\sketch\ssd1306_128x64_i2c.ino.cpp.o" "D:\B4R\Objects\bin\libraries\SPI\SPI.cpp.o" "D:\B4R\Objects\bin\libraries\Wire\Wire.cpp.o" "D:\B4R\Objects\bin\libraries\Adafruit_GFX_Library\glcdfont.c.o" "D:\B4R\Objects\bin\libraries\Adafruit_GFX_Library\Adafruit_GFX.cpp.o" "D:\B4R\Objects\bin\libraries\Adafruit_SSD1306\Adafruit_SSD1306.cpp.o" "D:\B4R\Objects\bin/arduino.ar" -lapp_update -lbootloader_support -lbt -lbtdm_app -lc -lc_nano -lcoexist -lcore -ldriver -lesp32 -lethernet -lexpat -lfreertos -lhal -ljson -llog -llwip -lm -lmbedtls -lmicro-ecc -lnet80211 -lnewlib -lnghttp -lnvs_flash -lopenssl -lphy -lpp -lrtc -lsmartconfig -lspi_flash -ltcpip_adapter -lulp -lvfs -lwpa -lwpa2 -lwpa_supplicant -lwps -lxtensa-debug-module -lgcc -Wl,--end-group -Wl,-EL -o "D:\B4R\Objects\bin/ssd1306_128x64_i2c.ino.elf"
"python.exe" "C:\Program Files (x86)\Arduino\hardware\espressif\ESP32/tools/esptool.py" --chip esp32 elf2image --flash_mode "dio" --flash_freq "80m" --flash_size "4MB" -o "D:\B4R\Objects\bin/ssd1306_128x64_i2c.ino.bin" "D:\B4R\Objects\bin/ssd1306_128x64_i2c.ino.elf"
Der Sketch verwendet 159827 Bytes (15%) des Programmspeicherplatzes. Das Maximum sind 1044464 Bytes. Globale Variablen verwenden 10976 Bytes (3%) des dynamischen Speichers, 283936 Bytes für lokale Variablen verbleiben. Das Maximum sind 294912 Bytes. I had posted my compilation protocoll in the previous message (via edit). I see that Arduino15\packages is involved in yours and my test. The Arduino15 is a strange folder. Occasionally, when things went wrong, I had to delete that folder. It will be cleanly rebuilt, but the preferences have to be reentered. ,to delete its contents and to copy the zip's contents to the ESP32 folder (watch what is in before and after). Thanks All - Have looked at the python script get.py (esp32\tools folder) used for step #5, which downloads and upzips the latest package as defined in the json package file. With that, indeed two options by either copy as mentioned post #18 or run python get.py from the esp32\tools folder (part of step #5). Looking forward to the upcoming - according to here most of the framework is done - have not seen a timeline yet for completion, so wait and see. From the Arduino IDE it still works. Could it be that B4R looks in different locations than Arduino IDE? What does this mean for the path: "sketch\Adafruit_SSD1306.cpp: In ..." in the error message? The Arduino OLED example did not compile lastly in your system. Has that been fixed with the new GFX lib?